“What I Intend” by Robert Reed is an Asimov’s Science Fiction magazine Readers’ Awards Finalist in the short story category. 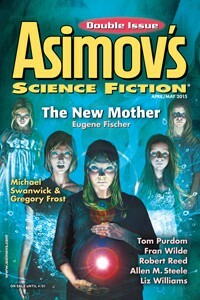 It was originally published in Asimov’s April/May 2015 issue. Currently, this story and most of the other finalists are available to read for free on the Readers’ Awards Finalists page at Asimov’s. Now this was an old trope presented in an original way. A Steve Jobs type character, a man with loads of money and loads of influence, announces that he is searching for extraterrestrials. People treat him as a madman, but the search has already begun with promising results, and he is expecting to learn about new technology in the messages that are being sent out from far stars. But the reality is quite different. I liked this story a lot. I don’t think it is the winner of an award, but it deserved to be short-listed. It is a straightforward story, told linearly, from beginning to end. It has a media interview at the beginning and another at the end to frame the story, which worked well, I thought.